What is the Origami Paper Size Calculator? People often ask me how to work out what size paper they need for a specific sized box. I have created this calculator so that you can work out what size paper you need OR what sized box/model you will end up with. Example: You want your origami box to be at least ’10cm’ wide (in order to fit a gift), you can use this to figure out what sized paper to start with. 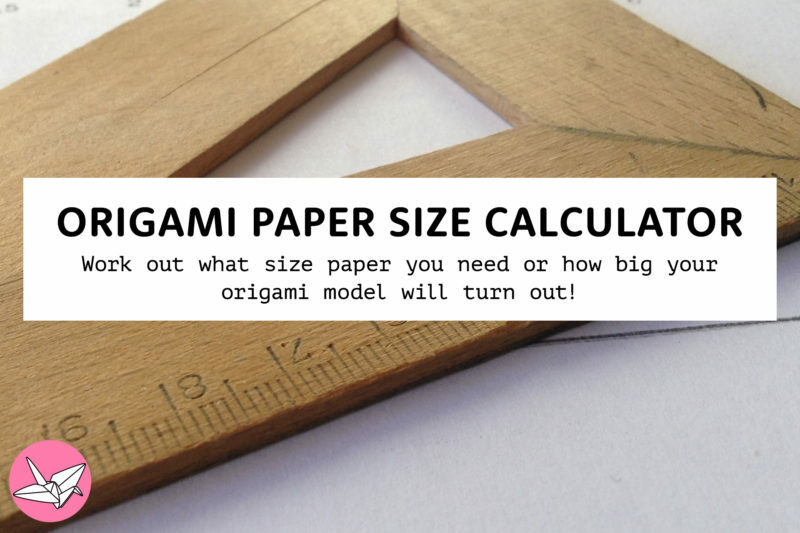 If you are trying to figure out what size paper to use when the origami model starts with a non-square, check out the Origami Paper Ratio Calculator. In order to use the calculator, you will need to have some info: the paper size used and the resulting model size. So either the tutorial has it listed (most tutorials on my website have this info), or you will have to make the model with a test sheet and note the results. There is (usually) no way to get an exact specific sized box, instead – go for the largest side of your object and use that as the ‘Required size’ (maybe add a couple cms). Also this calculator may only work for models that are made with square paper – although you can enter the longer side if it’s not and it may work  . This is the same sum as before, but it’s easier to understand – if the origami model has 2 sheets of paper that are different sizes. For example, say there is a box that starts with 20 x 20 cm and 12 x 12 cm paper – what sized paper to use if you want to start with 30 x 30 cm as the larger paper? If you’ve worked out the size of non-square paper, after you have your longer size, visit the paper ratio calulator to get the correct size of the other edge. I need to make two rectangular boxes that fit together (box and lid box). oh thank god i found this page … i was going insane trying to figure out how to fit my gift in a masu box!! i got my friend some pokemon cards and now they are fitted inside a nice origami box yay!!!!!! !